Step the right foot up toward the hands, and lay the right leg on the mat: right knee behind right hand, right foot in behind left hand. The right heel should be in line with your left hip point. Lower your body down onto the floor. Straighten the left leg and lengthen it straight behind you; uncurl the left toes and press the top of the left foot into the floor. Bring your hands back alongside your hips. 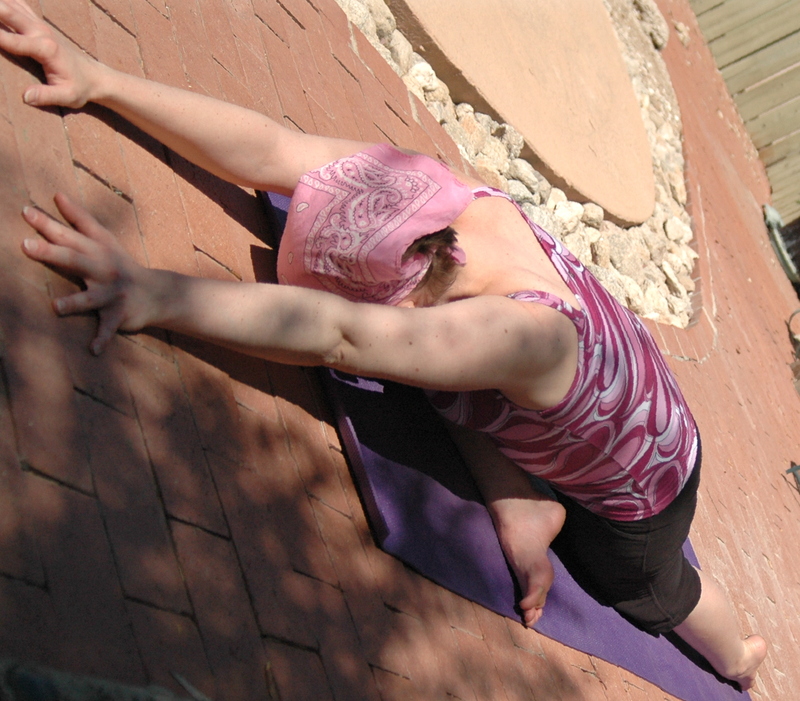 Pressing your hands into the floor, breathe in and rise up into a gentle backbend. Lengthen your spine. Make sure your weight is distributed evenly over both hips. Fold forward over the right leg. Keep your spine straight and don’t hunch your back. You can rest your hands or elbows on the floor in front of you. If you’re able to bend more deeply, rest your forearms on the floor. You can cross your arms and rest your forehead on your hands, or stretch your arms straight out and rest your forehead on the floor. Breathe slowly and deeply as you relax into the pose. Don’t push yourself – let gravity pull you deeper into the pose. Press palms into the floor and come out of the pose, pressing back into downward-facing dog. If you are able, curl your left toes under and press back while bringing your right leg straight up into one-legged dog. Pigeon pose is a deep hip opener and stretches the thighs, groins, and psoas. Stretching the piriformis muscle can relieve sciatic pain. Those with hip or knee problems should practice this pose gently. Those with lower back problems may want to omit the backbend. Pregnant students should take care with any forward-bending pose. I love pigeon pose. It’s a pose that just feels good! I love the feeling of my hips opening in this pose. When I practice pigeon, I always feel I can just relax and enjoy the pose. My mind feels calm and relaxed in this pose. I also feel a sense of achievement that I can bend forward and rest comfortably in the pose. Pigeon is also challenging – I’ve been working on the royal pigeon backbending variation, but my hips and low back aren’t quite open enough to move deeply into the backbend. I have a long way to go before I’ll be able to bring the back foot up to my head! I love that pigeon still has challenges in store and provides a deep stretch no matter what the level of the yoga student. …May favorite asana ever… Thank you, Rox!